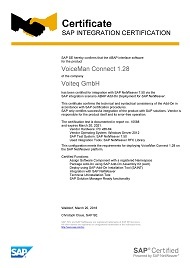 Voiteq today announced its VoiceMan Connect (Version 1.28) has achieved SAP certification as powered by the SAP NetWeaver® technology platform. The solution integrates with SAP NetWeaver enabling the customer to run a Pick-by-Voice solution integrated in SAP. The entire business logic for the voice process can be developed in SAP using ABAP. This eliminates the need to use other programming languages such as HTML, Java etc. VoiceMan Connect is powered by SAP NetWeaver. Solutions that are powered by SAP NetWeaver can be more quickly and easily integrated into SAP® solution environments. Customers can benefit from improved interoperability with SAP applications and with the large ecosystem of solutions that run on SAP NetWeaver. Choosing an SAP-certified solution can also help reduce overall IT investment costs and risks. “We are delighted to announce the successful achievement of our VoiceMan Connect now certified as powered by SAP NetWeaver,” said Andrew Guske, Managing Director at Voiteq GmbH. “ The ability of VoiceMan Connect to run on SAP NetWeaver and interoperate with other SAP NetWeaver-based solutions will prove highly beneficial to our current and future customers. VoiceMan Connect gives customers a flexible and high-performance interface into their WMS or ERP environment, enabling efficient handling of warehouse processes as well as ensuring real-time visibility and traceability. VoiceMan Connect can integrate any shop floor technology such as voice, scales, fixed scanners or cameras with any host system. Its highly flexible architecture provides a future-proof platform that can easily be extended or adapted to changing business requirements.